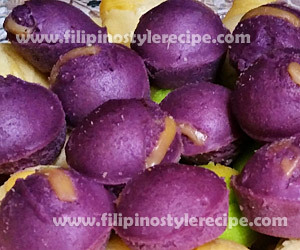 Filipino Style Recipe: Puto Ube is another variety of popular Filipino steamed mini rice cake. It is often eaten for breakfast served with hot coffee or sometimes during meryenda (mid-afternoon snack). Some like to eat it with dinuguan “a pork blood stew”. 2. In a bowl, mix together dry ingredients then sift. 3. Pour in the water and evaporated milk and stir well. Mix in the eggs, ube flavour, violet food powder and butter. Do not over mix. 1. In a steamer, boil water then wrap the over with a towel. 2. Grease mini muffin pans then pour the mixture into molds 3/4 full. Top with cheese. 3. Steam over medium heat for 20 minutes or until a toothpick inserted into the centre of a muffin comes out clean. 4. Let it cool slightly before removing from the muffin pans.